International Junior Performance Tennis LLC formed in 2012. Chad and Elana Campbell had recently moved from England, where their children were introduced to tennis under the LTA's Mini Tennis program. Upon arriving in the US, they quickly discovered how little the USTA's 10 and Under Tennis program had been accepted by the tennis community. We set out to change that. IJP Tennis is dedicated to developing junior tennis players into elite athletes, introducing the sport of tennis to the next generation of players, and generally promoting the sport of tennis. We are advocates of the International Tennis Federation's Stay + Play Tennis 10s methodology. We believe that a systematic approach (Red, Orange, Green, and then Yellow Ball) is the most successful method of developing young players. Countries around the world have been following this format for years, but the USTA has only recently implemented its 10 and Under junior tennis program. Our Director of Tennis, Matt Sunter, has extensive experience in the Tennis 10s development pathway. He has trained elite juniors players around the world. He also loves Liverpool Football Club, but please don't hold that against him! A native of Melbourne, Australia, Matt Sunter has been coaching tennis professionally around the world since 1999. He has trained elite juniors in Australia, the UK and throughout Europe, and the US. He has produced several top-ranked juniors (Orange, Green, and Yellow ball) in the USTA rankings. Steve Etchells joined the IJP Tennis team in 2018, with a dozen years of coaching experience in England and the US. A native of the UK, Steve holds a BA in Physical Education from Leeds Metropolitan University. Previously, Steve was with Cliff Drysdale Tennis and ran tennis programs at sites across the US. 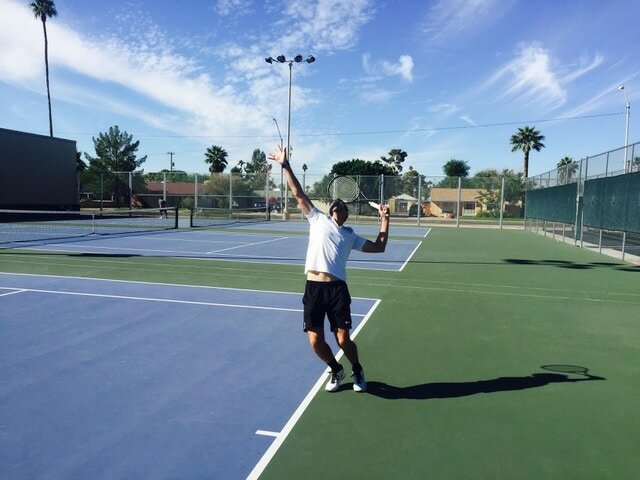 In his free time, he plays in the USTA leagues in Phoenix. Karen Fleissner hails from Colorado, and came to Arizona for college and has been here since. Having a fine arts degree in Dance, she has a strong background in fitness, and is a licensed Cardio Tennis instructor. She has been coaching 10 and Under Tennis for over three years, and loves working with junior players. She joined the IJP Tennis team in 2017.